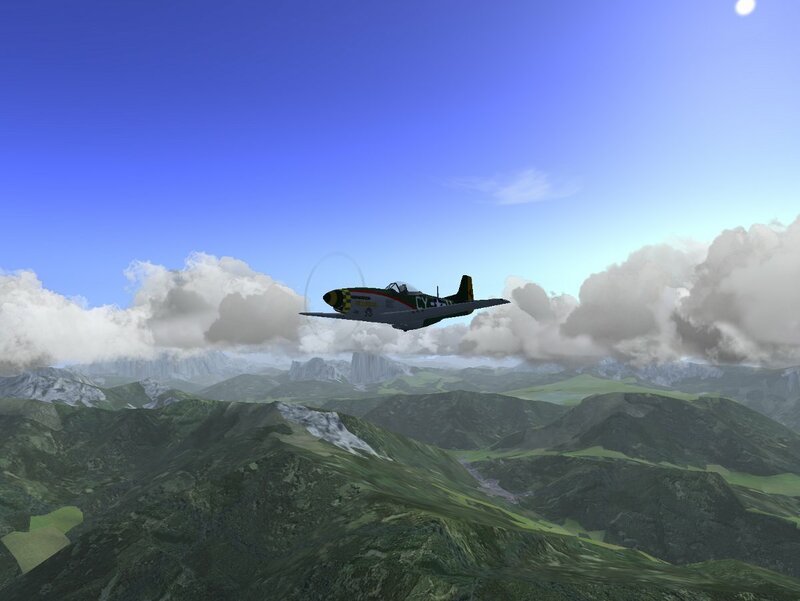 The screenshots shown in the following use shaders, textures and scenery which are for various reasons (incompatible license, too recent development,…) not part of the official Flightgear 2.6 release. 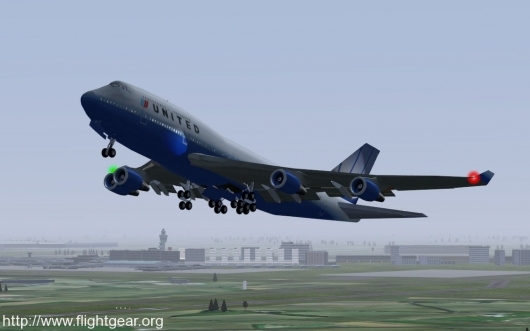 However, these are available for download and every feature works with Flightgear 2.6. 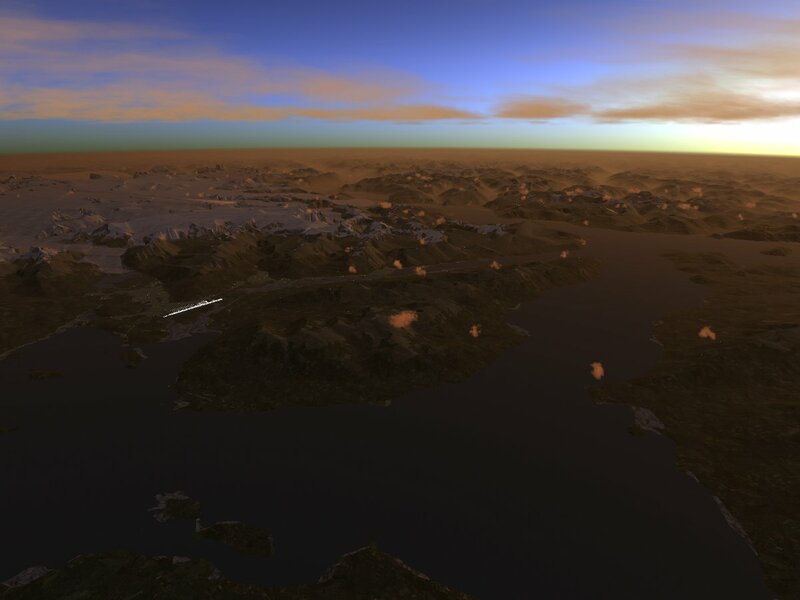 The following packages need to be installed in addition to get to see the same: lightfield shader package v1.1, Juneau custom scenery, and textures from regional textures v0.1. 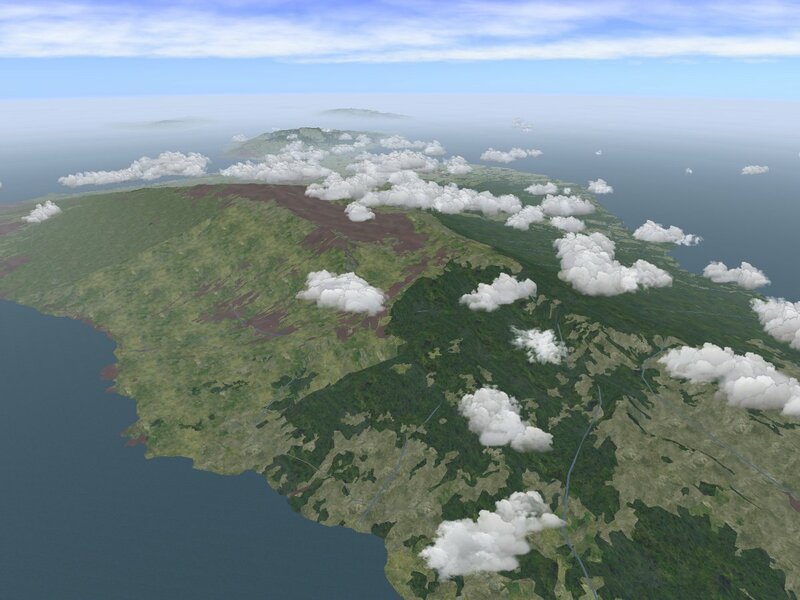 Without a doubt, clouds, haze and fog are the most easily noticed features of weather in a flight simulation, followed by winds. 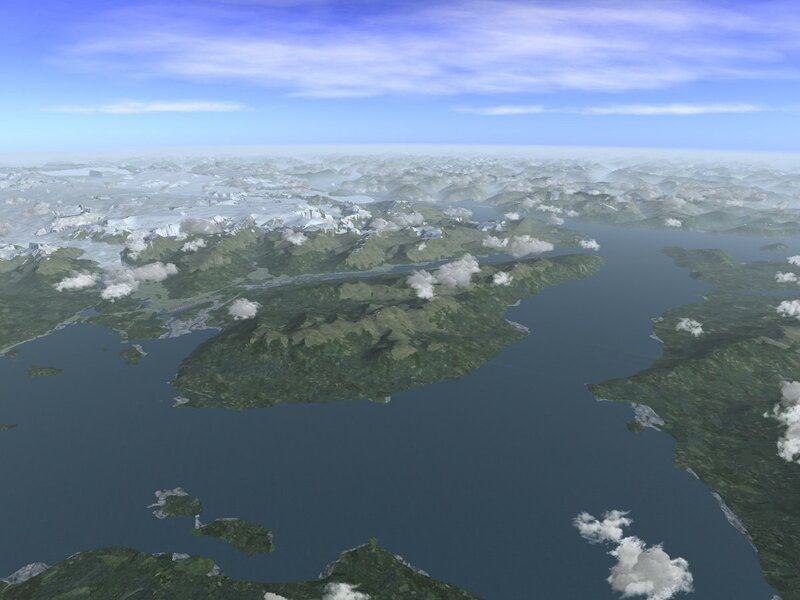 Advanced Weather v1.4 is however more than a tool to draw clouds and set wind parameters – it is a system with a (limited) understanding what the weather which it currently tries to render is, and it aims to simulate features of atmospheric physics. This means that different weather phenomena tie together – winds and terrain influence the way cloud formation is taking place, cloud formation and the formation of thermal updrafts is connected, and weather is always understood as part of a large-scale weather pattern involving high and low pressure systems. At the same time, clouds and atmospheric haze also influence the atmospheric light (and now also the scenery) in an essential way – strong fogging changes the color of sunrises to a blue-grey, wave patterns on the ocean follow the wind strength and direction and rain causes visibly wet runways. Let us have a look at how this works in fair weather. Fair weather is typically characterized by convective cloud development: The sun heats the terrain and the air layer just above, thus warm air rises up in ‘bubbles’ and forms thermals, as the air rises, it expands and cools and eventually the moisture condenses into droplets, forming the characteristic, cauliflower-shaped Cumulus clouds. Cumulus clouds are the most common example of clouds formed by pronounced vertical motion of air. As every glider pilot looking for thermals has to learn quickly, the formation of convective clouds depends on many different factors. The terrain type is crucial – while rock or concrete surfaces heat well in sunshine and may easily lead to well-developed thermals and cloud formation, open water or ice is much less likely to heat up in sunshine and seed Cumulus formation. High points in the terrain mark the spots where the bubbles of warm air are most likely to lift off the ground. Another important factor is the time of the day: The sun needs sufficient time to heat the terrain, therefore Cumulus formation is densest around noon, but the thermal updrafts are strongest in the afternoon, and while pronounced Cumulus clouds are unlikely to form in the morning, the thermal energy accumulated over a day may still give rise to well-developed clouds in the evening. Later in the day, the cloud formation is somewhat stronger. Note how clouds tend to form over mountain peaks, but do not form over open water. Also, no strong cloud development occurs over Taku glacier in the upper left, despite its high altitude, as the ice surface does not heat well in the sun. At noon, the thermal updrafts become stronger and consequently the clouds become more well-defined. While in the morning the upward motion of air rarely exceeds 0.5 m/s, around noon this becomes rather 1 m/s, to strengthen even more in the afternoon. Yet a few hours later, the number of clouds decreases again as the thermal irradiation by the sun weakens, but then typically fewer but stronger thermals with larger cap clouds are found. Towards sunset, there is still significant thermal energy left to lead to sizeable cloud development, although the number of clouds as well as the typical strength of thermals is decreasing again. During the night, the development of convective clouds breaks more or less down completely as there is no thermal energy from the sun available. With 20 kt winds coming from the north, the picture changes quite drastically: clouds are now pushed up all the way to the summit of Haleakala by the rising air, whereas the falling air south of the crater creates a lee effect in which convective clouds disappear. The vegetation pattern of Maui reflects these prevaling conditions – while moist air is carried up all the way to the summit of Haleakala, it rains off and irrigates the northern slopes of the mountain, leading to a bright green forest belt. The southern slopes on the other hand see typically falling air and dissolving clouds, and are consequently much drier. If the appropriate option is selected, thermals are automatically generated along with Cumulus clouds so that thermal soaring is possible. 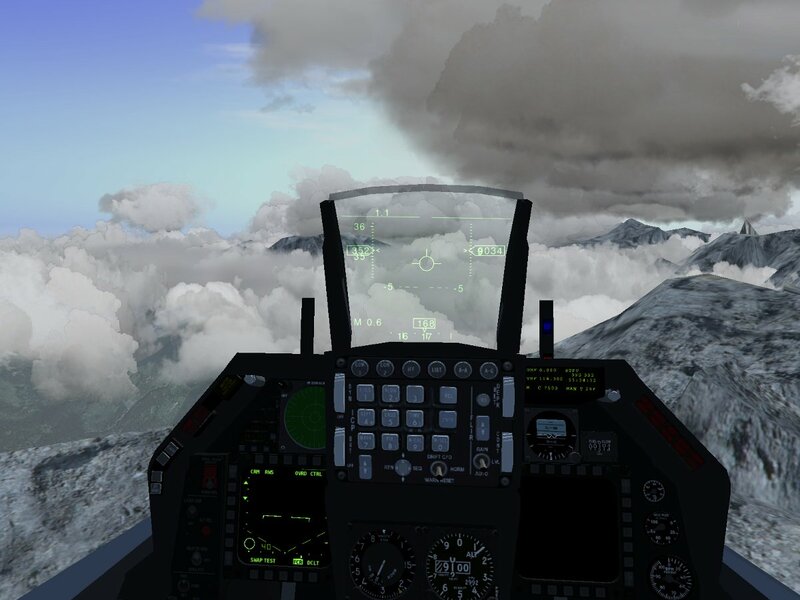 Combined with the effect of ridge lift, this can make for rather realistic mountain soaring conditions in which a good degree of skill is required to stay in the air. But the detailed interplay between convection and the terrain leads to interesting scenes also in other planes. Around noon, the peaks of high mountains are often covered in rather dramatic clouds piling up against the slopes. Further down, the altitude of the cloudbase is no longer determined by the terrain but by the air layers. And yet, the terrain elevation and the change between land and water imprint a pronounced pattern onto the distribution of density, shape and size of convective clouds. Convection may also occur due to vertical instabilities in upper air layers, leading to the development of Altocumulus clouds, or at even higher altitudes Cirrocumulus clouds. Here’s an example of the development of Altocumulus fields at 15.000 ft. At such high altitudes, the clouds are no longer influenced by the terrain underneath, but rather by the properties of the air layers between which the Altocumuli form. For instance, Altocumulus development may be caused by the instabilities associated with an approaching cold front, and may thus signal the danger of severe thunderstorms in the near future. The Advanced Weather offline weather generation automatically includes this and other rules of large-scale weather patterns. 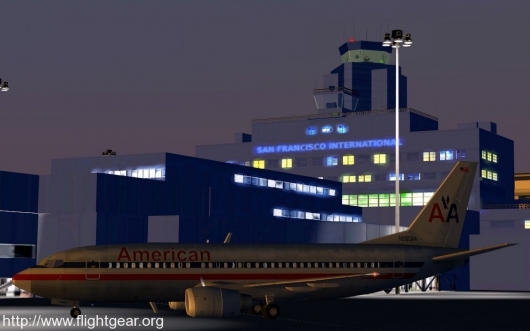 The FlightGear development team is happy to announce the v2.6.0 release of FlightGear, the free, open-source flight simulator. This new version contains many exciting new features, enhancements and bugfixes. 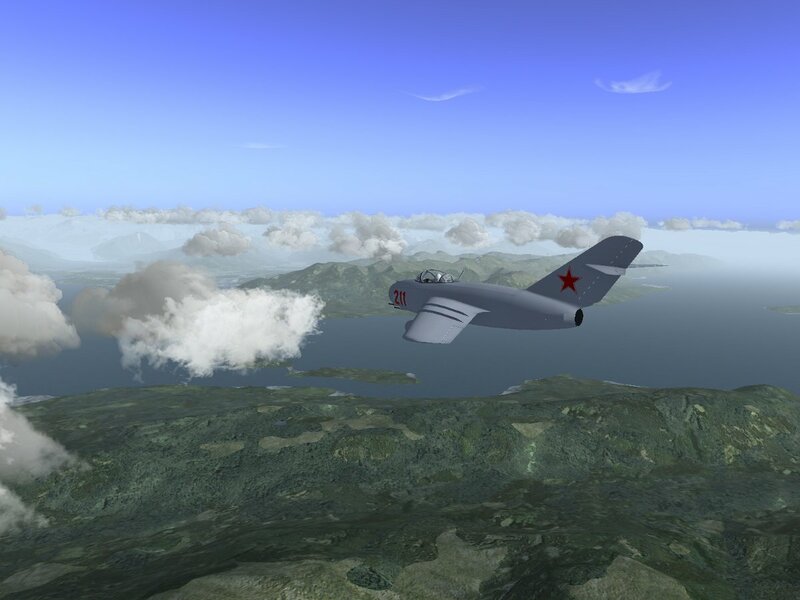 Major improvements from v2.4.0 include reduced AI aircraft load times, easier graphics tuning, more sophisticated AI aircraft and improved usability. 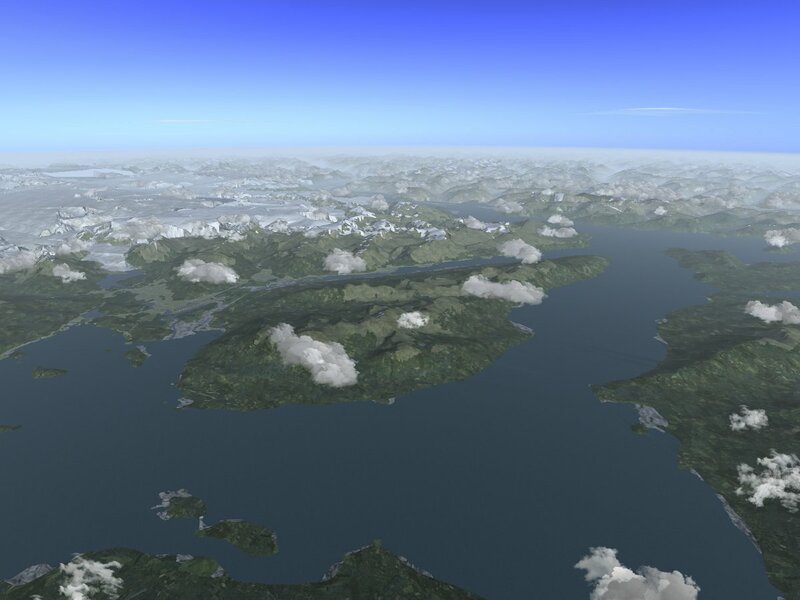 FlightGear features more than 400 aircraft, a worldwide scenery database, a worldwide multi-player environment, detailed sky modelling, a flexible and open aircraft modelling system, varied networking options, multiple display support, a powerful scripting language and an open architecture. 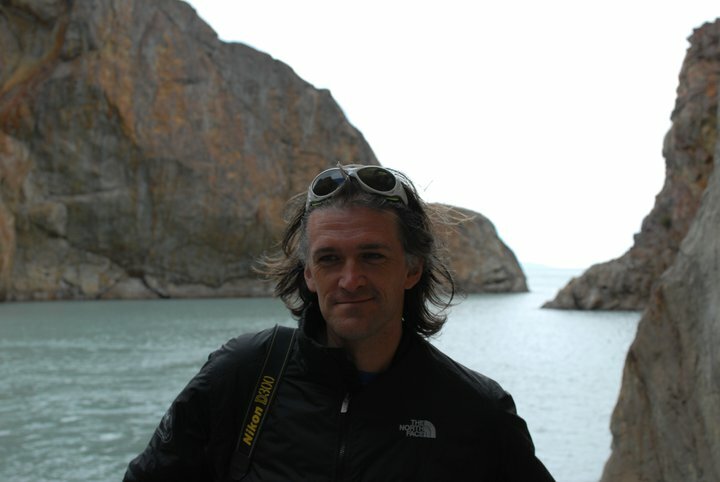 Best of all, being open-source, the simulator is owned by the community and everyone is encouraged to contribute. At selected airports, FlightGear can automatically start at an appropriate parking spot based on the size and type of your aircraft. At airports which support this feature, a visual display of the taxi route on the ground guides you to the active runway, while following the correct taxiways. 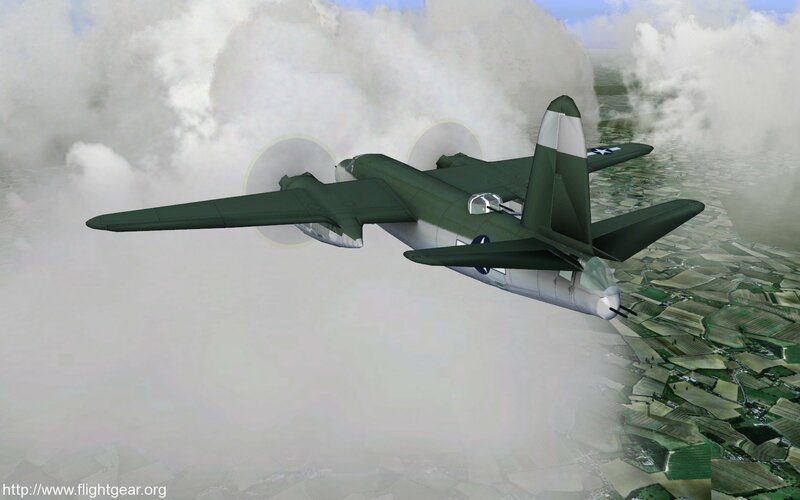 To reduce stuttering during model loading and take further advantage of multi-core CPUs, MP and AI aircraft models are now loaded in a background thread. To reduce load times still further, only the parts of the aircraft currently visible are loaded from disk. AI and multiplayer aircraft are no longer silent objects, they can produce sounds just like the main aircraft. 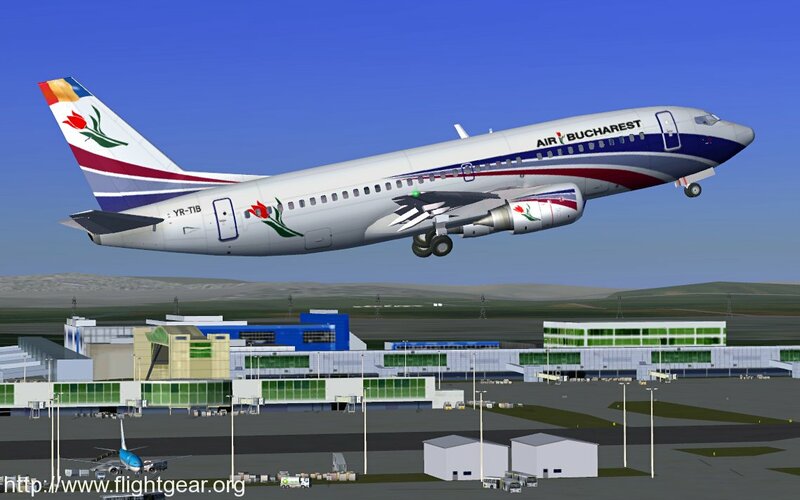 Many new and updated AI aircraft and liveries. 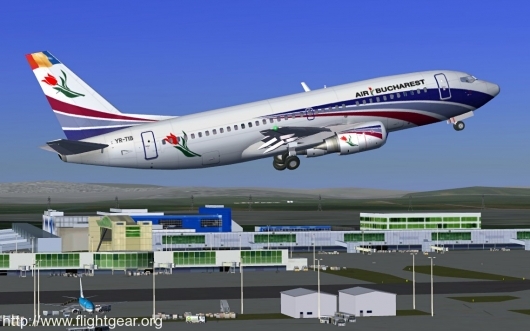 Over 80 airlines now populate the virtual skies. The range at which AI aircraft are displayed is now configurable, allowing you to tune FlightGear for best performance. AI controlled pilots have received extensive landing training and now make a more realistic approach and vacate the runway when able. The simulator now assigns an available parking position on startup. The JSBSim flight dynamics model received a major overhaul. 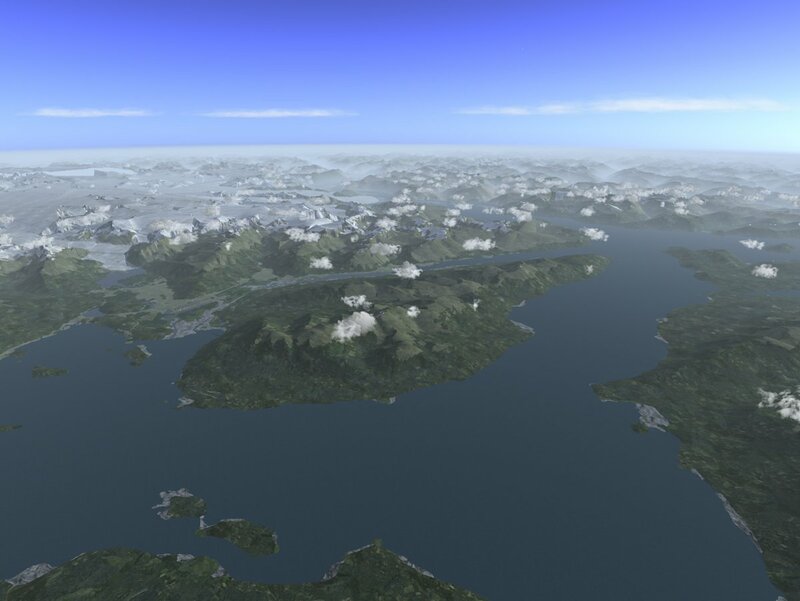 The Local Weather package has been further integrated with the FlightGear core, and has been renamed “Advanced Weather”. New rendering techniques allow more detailed clouds with no performance impact. 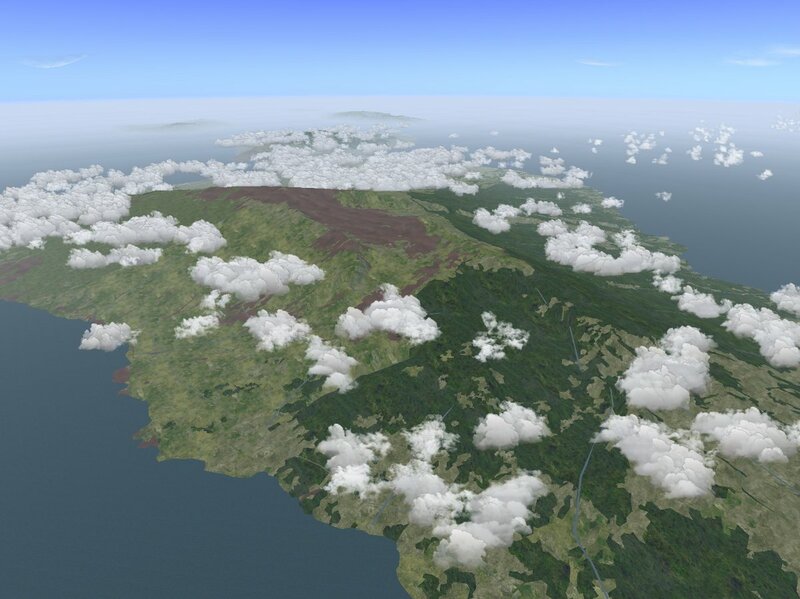 High altitude clouds are rendered more realistically, and clouds move with the wind without impacting performance. New replay system. Video-player like controls, including slow motion and fast forward. Pilots can now take over the aircraft at any time during a replay. Great for training particular flight phases such as approach over and over again. Aircraft status ratings are displayed in the FlightGear launcher, allowing you to see at a glance the FDM, model, systems and cockpit quality for rated aircraft. Multiplayer settings can be accessed in-sim. You can now choose your callsign, select an MP server and connect within the simulator. Automatic scenery download is now even easier to use. Simply select the scenery directory to download to, and switch it on. Individual graphics effects can now be configured from within the Rendering Settings dialog, allowing you to fine-tune the performance of FlightGear within the sim. The simulation of radio signal propagation has started and will make the reception of ATC messages and navigation aids more realistic in the future. A new set of options makes it easier to create seamless and zoomable multi screen setups. A new performance monitor shows the time spent in each subsystem. Boeing 777-200ER: many additional and updated features, including autopilot, instrument displays and animations. CMake is now the official build system on Linux, Mac and Windows. The sea now looks more realistic. Waves align with the wind, and foam appears at high wind speed. Steep slopes now appear rocky. Runways now appear wet during rain showers. 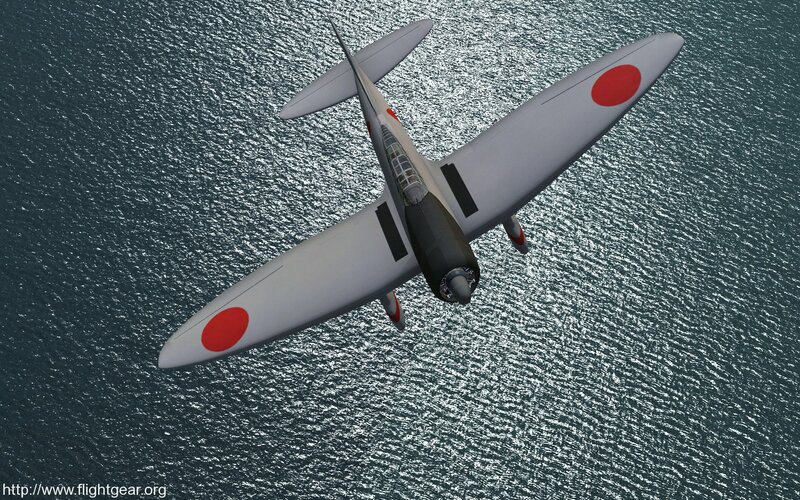 To help aircraft developers, a single shader combining bump-map, specular, reflection and light mapping components is now available. Additional joysticks and rudder pedals are supported out-of-the-box, including the Logitech WingMan Interceptor, Saitek Pro Combat Rudder Pedals and Thrustmaster HOTAS Warthog. FGPanel, lightweight software to render 2D instrument panels, is now included as part of the release. As a skydiver adds more gear such as front packs and items strapped to legs or arms, the jumper’s basic stability in free-fall is reduced. It becomes easier to tumble out of control and there is less margin for error. Similarly, the aerodynamic wake of the jumper may interfere with pilot chute opening (known as “hesitation”). Investigating different gear configurations generally involves vertical wind tunnel testing, or actual tests with jumpers. To avoid some of the cost, and mitigating safety concerns, a tool to computationally analyze these jumpers and their gear is highly desired. 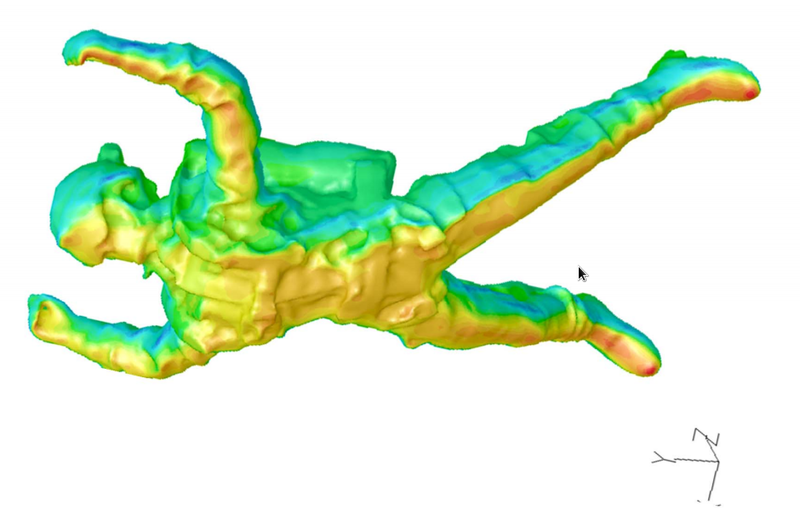 Creare, Inc., an R+D research firm in Hanover, NH, under funding from the US Army, developed a Computation Fluid Dynamics toolkit for analyzing jumpers and their equipment, and model the resulting configurations in FlightGear. 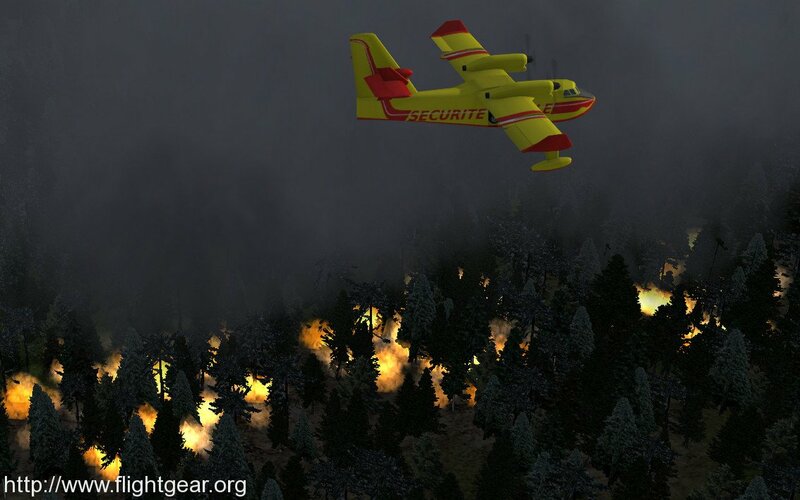 Note: a flyable parachutist model is available to download and test at the end of this article. CFD = Computational Fluid Dynamics. ANSYS Fluent is a high end CFD that models flow, turbulence, and heat transfer in 3d. Imagine being able to take a 3d model of a sky diver (or an aircraft) and place it at different orientations and different poses. Then for each orientation and pose, run a computer simulation of exactly how the air flows around the sky diver, where pockets of turbulence are generated, and what forces and moments are produced. Imagine all the combinations of roll and pitch and body poses possible — it leads to a huge number of combinations. Now imagine repeating that for several different arrangements of front and back packs and other equipment. You will need a cluster of computers running for days or even weeks to compute all the permutations just for a single pack configuration. This is essentially a “virtual wind tunnel” running on a super computer cluster of PC’s. In the case of the parachutist simulation: the amount of computation time required to generate 2 scenarios (with a back pack and without) was approximately 25,000 cpu-hours — or around 2 years of compute time on a single processor PC. 1000 individual simulations were run, each involving approximately 4 million “elements”. Real world testing and data collection was performed in a vertical wind tunnel (such as the one linked here.) This real world data could then be compared to the the Fluent (CFD) results to validate and possibly improve the computer model. For each component of the model, the local angle of attack and sideslip angle are calculated from the combination of the limb orientation and the overall angle of attack and sideslip of the entire model. The two-dimensional lookup tables are compiled from data extracted from the CFD results in the Solution Database. Aerodynamic forces and moments are transformed from the local frame to the global frame and then summed. Resultant forces and moments then determine accelerations, velocity and turn rates are calculated, and the model iterates. 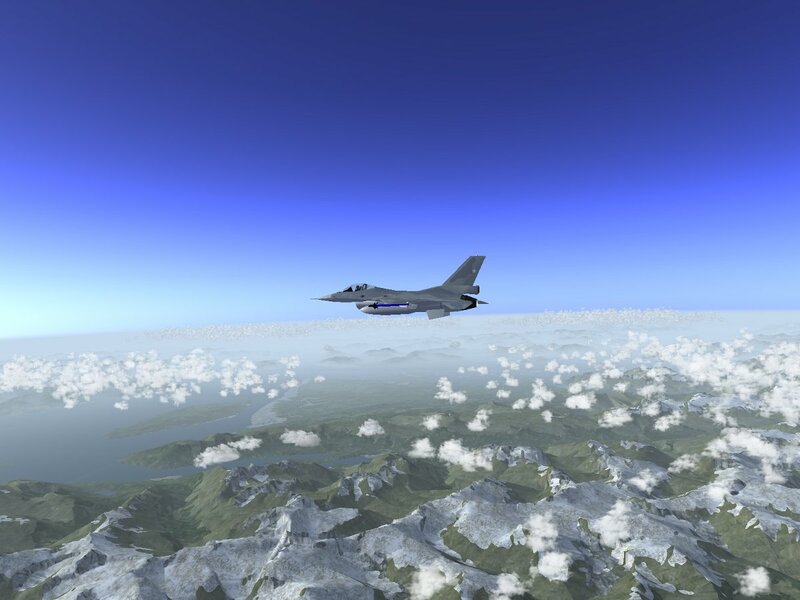 Creare partnered with Jon Berndt (the founder of JSBSim–one of the core physics engines used by FlightGear) to contribute some clever additions to JSBSim that permit a “blade element” approach to parachutist modeling. 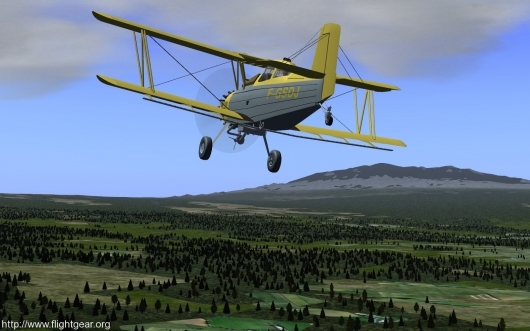 Jon helped tremendously optimizing and integrating the required new code into JSBSim which then ultimately led to its inclusion in FlightGear. The parachutist physics model is an order of magnitude more complex than a typical aircraft model. The character model is built out of several animated subcomponents: left & right forearms, left & right upper arms, left & right lower legs, left & right upper legs, head, torso, and pelvis. The model parts are attached in a cascading fashion like a real figure, and each joint can be rotated through all 3 axis (roll, pitch, and yaw.) In order to avoid unrealistic contortions, sensible joint range of motions are defined. There are a number of predefined poses where the appropriate joint angles have all been worked out in advance. Box: a neutral pose minimizing rotational or translational motion. Left & Right Translation: mirrored poses that induce a “slide” either to the left or right. Anterior Translation: a pose that induces a forward slide. Posterior Translation: a pose that induces a rearward slide. Dorsal: a “spread eagle” pose that maximizes surface area and thus minimizes decent rate. Ventral: a “compressed” pose that minimizes surface area thus maximizes decent rate. One of the neat things that a CFD analysis can produce are airflow lines that pass around the model. We can take the 3d flowlines that are produced by the CFD and attach them to the 3d model of the figure. This allows visualizing the flow lines from any FlightGear perspective. One interesting technical challenge is that the flow lines need to keep a fixed vertical orientation even though the model may roll or pitch, yet the flowlines must track the heading/yaw of the model. This can be done by setting up appropriate inverse transformations in the FlightGear model animation configuration file. 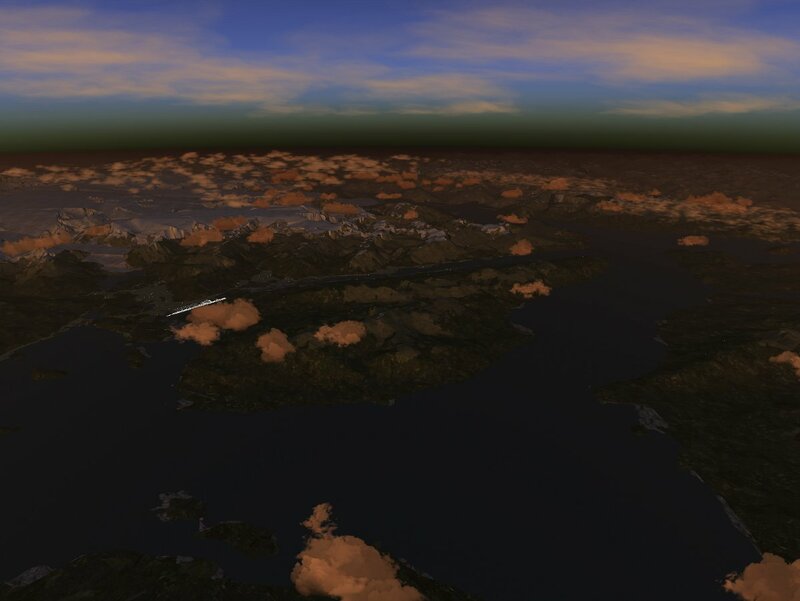 FlightGear offers additional visualization aids. The model is set up to support emitting smoke. 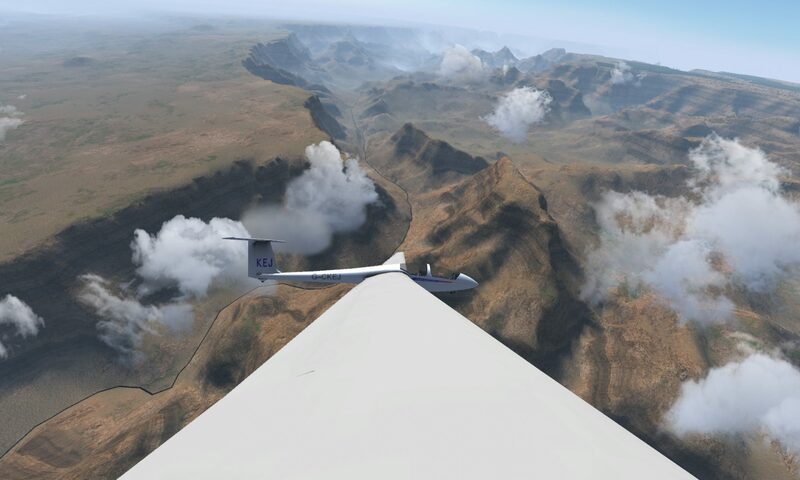 FlightGear smoke drifts with the prevaling winds (which can often be substantial at higher altitudes.) The model is also setup to emit “trajectory markers” at a fixed rate. 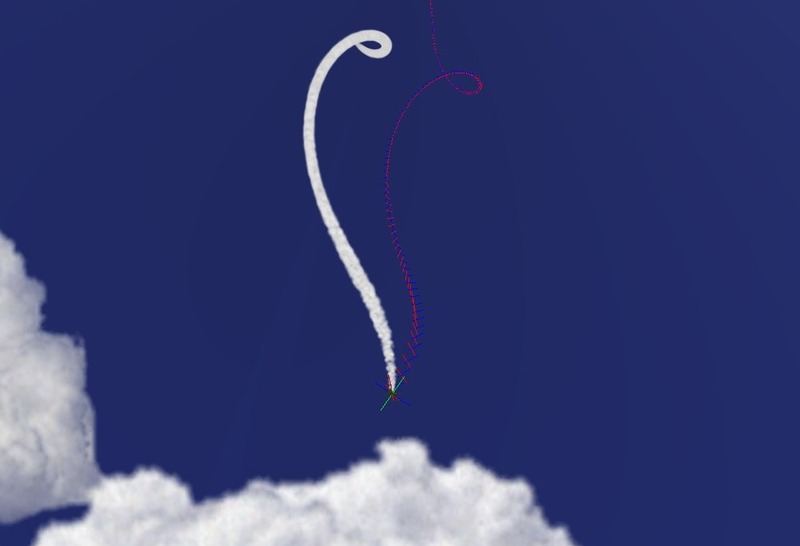 The trajectory markers stay fixed in 3d space and represent the actual path the sky diver follows. In addition they represent the orientation of the sky diver at that point in space. 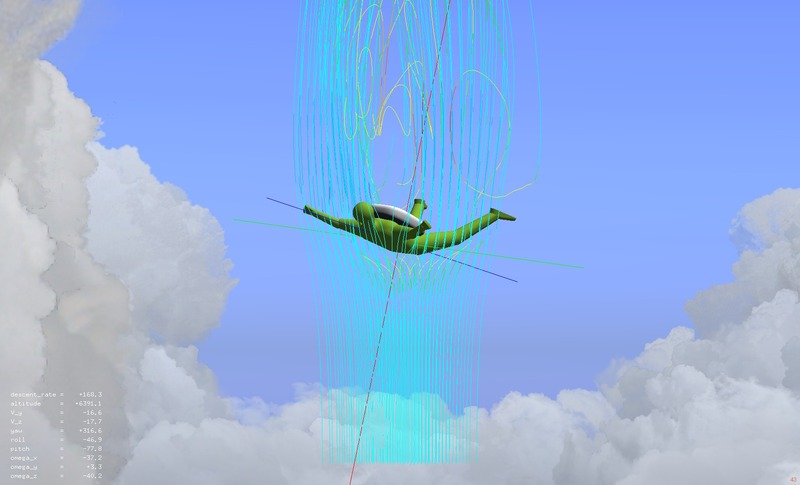 This exercise is setup as a free-fall simulation, not a parachute simulation so there is no chute modeled. Instead the simulation is mercifully paused when the altitude reaches 100′ above the surface. 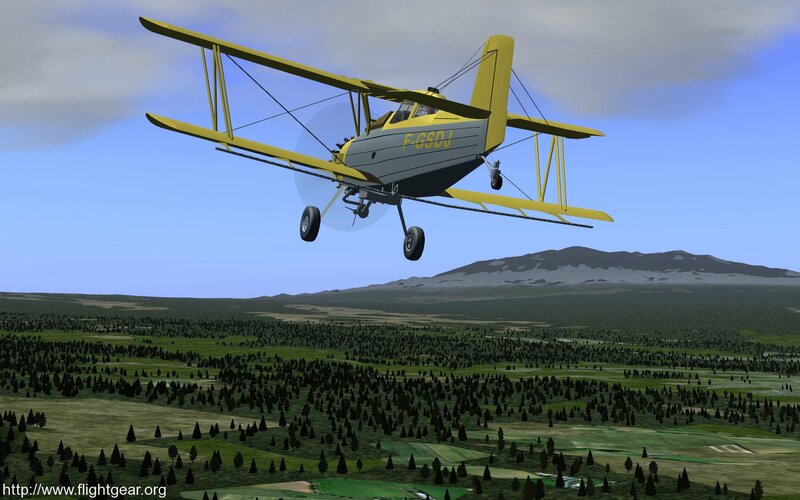 Note: the parachutist model is not compatible with FlightGear v2.4, you must fly this model with one of the v2.6 release candidates, or the official v2.6 release scheduled for February 17. Unzip it into your FlightGear “Aircraft” folder. Make sure you specify an initial altitude (such as –altitude=10000), otherwise you will just be sitting at the end of the runway working on your tan. Press F1 and F2 to toggle the two available dialog boxes on/off. You can manipulate the joint poses individually or select from a set of pre-defined poses, or select “Joystick” control and fly with a joystick (or keyboard or mouse) similar to flying a helicopter or airplane. 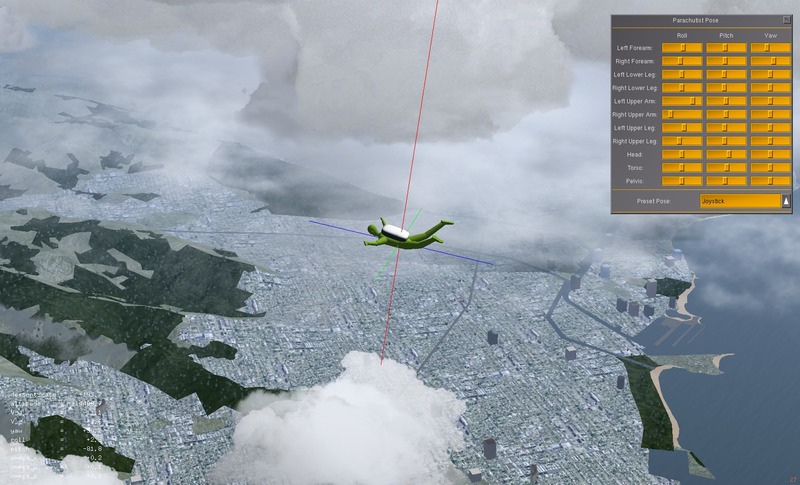 Dietz, A. J., Kaszeta, R. W., Cameron, B., Micka, D. J., Deserranno, D. and Craley, J.”A CFD Toolkit for Modeling Parachutists in Freefall”, presented at the 21st AIAA Decelerators Conference in Dublin, Ireland, 23-26 May 2011. Paper AIAA 2011-2589. 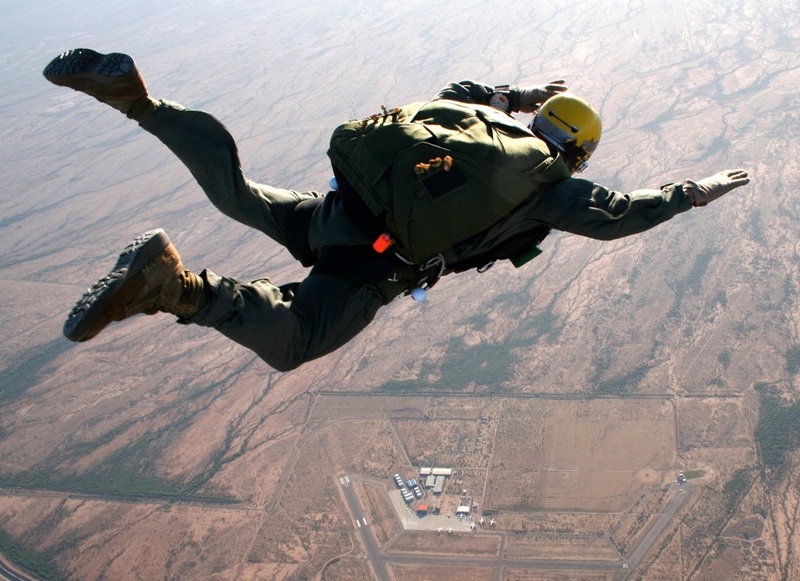 The Creare Freefalling Parachutist model was developed by Anthony Dietz (Principal Investigator), Richard Kaszeta , Benjamin Cameron, Daniel Micka, and Dimitri Deserranno of Creare, Inc., as part of an SBIR Phase II project sponsored by the U.S. Army RDECOM Acquisition Center under Contract No. W91CRB-08-C-0135. Additional contributions we made by Curt Olson and Jon S. Berndt as consultants. The resulting parachutist model is unvalidated and therefore, should not be used other than for demonstration purposes. Any opinions, findings and conclusions or recommendations expressed in this material are those of the authors and do not necessarily reflect the views of the US Army RDECOM Acquisition Center. Due to the significant contributions made to the project by several open source developers, Creare has released a version of the resulting parachutist model to the open source community for continued development and use. The FFTK itself continues development as a proprietary Creare project. For information on the FFTK itself, please contact Richard Kaszeta at rwk@creare.com, or 603-643-3800.